Once the fourth finger of your left hand is fitted with a beautiful diamond ring of your choice, you will never feel like parting from it. After all, it is a symbolic representation of many memorable moments in your relationship with your loved one. It would be ideal to select a jeweled accessory from the collection of gemstone diamond rings that are on display at reputed stores like Queen Jewels Inc. and others like it. Imagine the glorious smile on your partner’s face when you bestow a diamond-studded ring embellished with a colored gemstone upon her! The precious stone may be of any hue – ruby, blue sapphire, turquoise, emerald, tanzanite, sky blue topaz, opal, pink tourmaline, amethyst, aquamarine, topaz, pearl, etc. In case, you are preparing for diamond engagement rings for women, offer your fiancée a glorious handmade combination from an array of gemstone diamond engagement rings that are available at Jewels Queen’s store. For instance, you may opt for a fusion of white diamonds and cool blue sapphires, resplendent rubies and sparkling diamonds, natural diamonds and glittering emeralds, and so on. Every combination has its own unique character, charm and identity with gold beautiful engagement rings. Despite the free usage of vivid-looking and natural precious stones and diamond accent ring, the prices are remarkably reasonable. In fact, you may even avail of discounts. Additionally, every jeweled item is accompanied by a certificate of authenticity. Thus, whether you purchase a scintillating piece for an engagement celebration, a wedding ceremony, or an anniversary party, you may rest assured about the genuineness of its clarity, color, cut, and carat. Why Don’t You Grab This Opportunity To Express Your Personality Via Your Birthstone? Let us suppose that you were born in the month of December. The splendid sheen of blue-violet tanzanite is specifically meant for you. 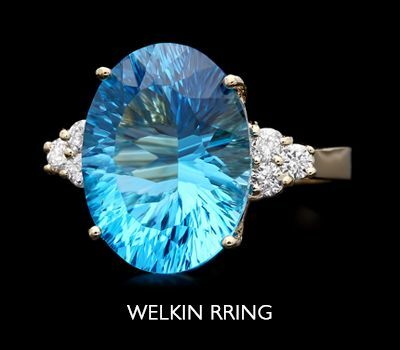 If you are not too enamored of tanzanite, opt for sky blue topaz instead. This is also meant for the December-born child. You will be displaying a rare gemstone, for it is not easily available. Yet, it is hugely popular and unique diamond rings. Now, the birthstone of the September-born, which is sapphire, is also a lovely blue. It is appreciated for dual reasons. For one thing, its visual appeal is wonderfully stunning. Secondly, this gemstone is a representation of good fortune and a virtuous character. The blue-green aquamarine is meant for the March child, symbolizing good health, protection and joy. In fact, ‘aqua’ refers to water, while ‘marine’ refers to wellness and happiness, in Latin. You may call it a symbol of rejuvenation, renewal, progress, life, or growth, but the fact remains that the glowing emerald is a favorite with most people. Of course, those born in the month of May, appreciate it more than anybody else does. July is synonymous with the fiery ruby. Red stands for passion, commitment, loyalty, and a love for challenges. Nonetheless, do not use the color of a gemstone to draw conclusions about the personalities of self or others. You should realize that cultural backgrounds and upbringing also matter a great deal.